The Asia Tribune T20 ended with a fitting closure as Americas Cricket Academy faced favorites Challengers. The Academy had capitulated Punjab a day earlier to maintain its run as dark horses. 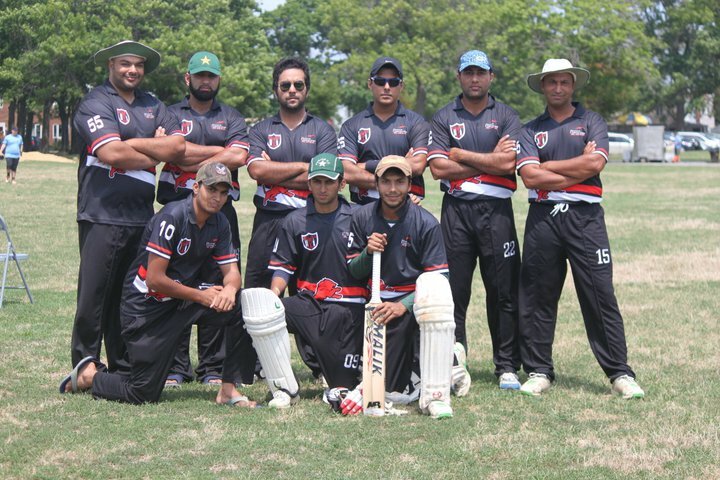 Challengers entered the fray as the side to beat on the back of their 2012 success in Millat T20 and NYPL T20 tournaments. Amid the fanfare, Challengers won the toss and elected to take first strike. As the teams prepared for their final pre-match conversations, the commentary team read the list of starting players for either side. For Challengers there were no surprises. In the other camp a startling omission, with Andre Kirton left out in bizarre circumstances making room for Hugh Craig who had sat out a day earlier, a genuine T20 all-rounder out for an off spinner. With the drama on its way Sean Stanislaus drew first blood only after four deliveries as Malik Razzak skied one to Dyon Ravello at mid off, 3/1. Ahmed Gulzar look to make up for the earlier loss as he stroked two consecutive boundaries through the covers off Greg Robinson. Gulzar looking to continue in the same vein offered a low catch to Michael Noble at cover off Stanislaus to be dismissed for 9 (5), 17/2. The third wicket pair of Usman Choudary and Saroosh Nadeem consolidated as theylooked to repair the damage. Choudary hit a maximum and Nadeem found the boundary ropes as they rotated the strike amid some miserly Academy bowling. Challengers seemed suppressed by the pressure as Choudary 13 (18) called for a quick single, only to find himself short, Rafeek Nazeer’s direct hit completed the dismissal, 40/3. Waqas Shah joined Nadeem as the pair maintained the ante as ACA dried up the boundaries. Prashant Nair struggled to find his line against a steady wind, but when he did Nadeem 19 (37) lost his wicket, bowled 67/4. Nair was again in the middle of the action to run out Waqas 15 (21) 74/5. Haider Shah looked to loosen the screws with a maximum to get off the mark with Mohammed Shafiq supporting on the other end. Haider 16 (12) found the boundary, before he held out to Nazeer at long on 91/6. Noble continued the procession as Burhan Siddique was bowled 96/7. Alex Amsterdam completed the penultimate over with the wicket of Irfan Mazhar 2 (5) caught at cover 103/8. The late innings tempo was indeed shy as Noble picked up consecutive wickets off the final two deliveries of the innings. Taimoor Haider was caught at short third man Nazeer dove forward to complete his third dismissal on the day. Last man Asad Janjua stumped by wicketkeeper Ryan Sukhdeo, Challengers 107 all out, Shafiq unbeaten on 11 (10). Michael Noble the pick of the bowlers 4-0-17-3, joining Nair with 8 wickets in the tournament. Stanislaus 4-0-10-2 and Amsterdam 4-0-13-2 with the other key contributions. Set 108 to win at a rate of 5.40 runs per over, Americas Cricket Academy were up for the challenge even with a batsman short. But it was Challengers who set about chart the course as Siddique began with a maiden over first up. Haider Shah followed up with the wicket of Noble 0 (3) caughtbehind 0/1. Siddique continued with negligible flaw only a wide conceded after his first two overs. Like Curtly and Courtney, Haider reaped the reward of Siddique’s effort as Nazeer was out leg before for a 12 ball duck. The score 8/2 as Nazeer fell to a dubious decision, a hint of bat was heard distinctly in the dugout. Stanislaus was joined by Amsterdam in a partnership, which was deemed to define the outcome. Like the openers the middle order pair struggled to release the challenging pressure. At the halfway stage ACA were 30/2, needing 78 runs from 60 deliveries. Amsterdam 9 (20) attempted to free the hold as he swept at Nadeem to be leg before, 30/3. Nadeem struck another critical blow as he breached the captain’s gates to leave the Academy staring at defeat. Stanislaus 17 (27) played a rearguard innings but left much undone at 31/4. Three more wickets fell for the addition of nine runs, one of which Haider had a hand in effecting a run out. At 40/7, Nair found an able partner in Ravello with 68 runs needed off 45 deliveries. The late order pair rotated the strike for 13 deliveries scoring at a run a ball. With 55 needed off 32 Nair targeted Nadeem’s left arm orthodox, whipping a six over long on, which was followed up by a boundary with a repeated stroke. The impetus, which was needed all innings, had finally arrived. The equation now stood at 45 from 30 at nine an over with three wickets in hand. Now ACA looked fancied to put on a late rally. The twisted in the tale was short lived as Ravello 5 (7) held out to long off 63/8, the innings’ best stand of 23 (16). Hugh Craig looking to push the score was run out, Haider involved again 66/9. The odds had now been restored in favor of Challengers. Choudary served up his first delivery, which turned out to be the last for the tournament a Robinson played all around it, bowled without scoring. Challengers lifted the Inaugural Asia Tribune T20 trophy. Americas Cricket Academy lost by 42 runs, as Nair was left unbeaten for a top score of 20 (15). For Challengers, Nadeem was the pick of the bowlers with 4-0-21-3, Choudary 0/1, Tamoor 1/7 and Asad Janjua 1/14 with a wicket each. 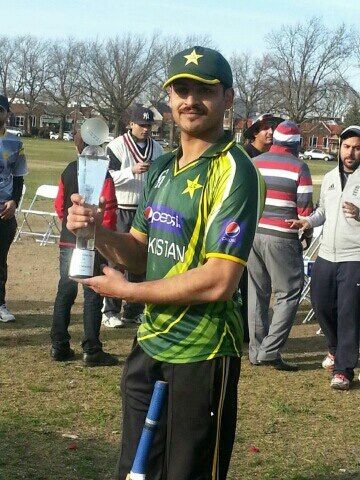 Haider Shah had figures of 3-0-13-2 in addition to his two run out and a cameo innings to earn the man of the match. This entry was posted in Headlines, News and tagged Americas Cricket Academy, Asia Tribune T20, Challengers CC, Haider Shah, Michael Noble, Rafeek Nazeer, Sean Stanislaus. Bookmark the permalink.